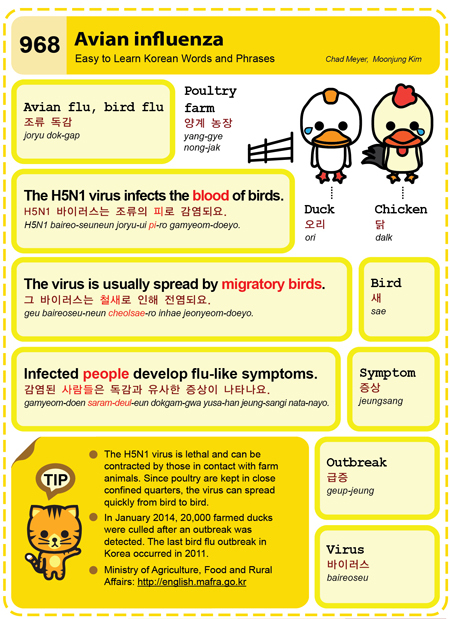 Easy to Learn Korean 968 – Avian Influenza. This entry was posted in Series and tagged avian influenza, bird, bird flu, blood, Chicken, culled, duck, H5N1, H5N1 바이러스는 조류의 피로 감염되요., migratory birds, Ministry of Agriculture Food and Rural Affairs, outbreak, people, poultry farm, symptom, virus, 감염된 사람들은 독감과 유사한 증상이 나타나요., 그 바이러스는 철새로 인해 전염되요., 닭, 양계 농장, 오리, 조류 독감 by easykorean. Bookmark the permalink.